The 2nd Green Flag is about saving Energy. A lot of energy is wasted by leaving lights on, having televisions & DVD players on 'stand-by' and also by leaving radiators turned on with windows open. The Green Team, the children and teachers sought to change our old habits. Now, after discussing the reasons for saving energy at length, everyone in the school now makes an effort to ensure that windows are closed when radiators are on; that lights are turned off when they are not needed and fully turning off 'stand-by' equipment. The radiators in all the classrooms also have thermostatic valves to keep them at certain temperatures to stop wastage. 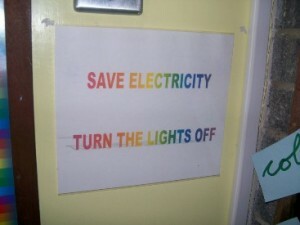 For our 'Green Day', we also tried living without electricity in the school for a day. While certain essentials were left on, CD radios, computers and lights were turned off for the day. It was possible! All thanks to the hard work and diligence of everyone. You can find out more about our 2nd Green Flag accreditation at the Green Schools Ireland website.